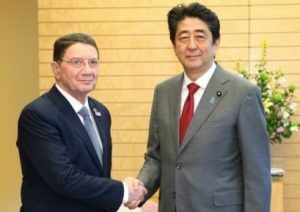 Madrid (Spain) – March 21, 2017 (travelindex.com) – The Secretary-General of the World Tourism Organization (UNWTO), Taleb Rifai, applauded Japan’s commitment to tourism development as one of the significant pillars of the socio-economic agenda during a recent official visit to Japan. Meeting Prime Minister Shinzo Abe, Mr Rifai welcomed Japan’s Action Program for Tourism focused on infrastructure development, visa facilitation and technology. The visit was also an occasion to inaugurate the Tokyo Liaison Office of the UNWTO Regional Support Office for Asia and the Pacific(RSOAP)based in Nara in the presence of the 17 UNWTO Affiliate Members of Japan and 200 key tourism leaders and stakeholders. The office will provide supplementary support to the activities being carried out from the Nara-based office.